The Government has invested approximately $3.2 million in Fijians living between the Suva-Nausori corridor. 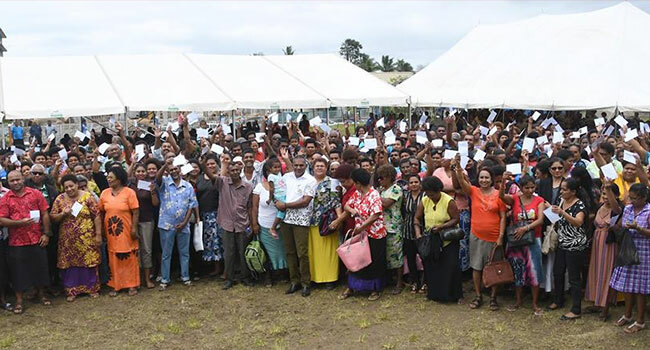 This was highlighted by Minister for Industry and Trade Faiyaz Koya during the disbursement of micro and small business grant at the Valelevu grounds in Nasinu. A total of 1005 micro and small business entrepreneurs of Suva received their $1,000 grants today as part of the 41st phase of disbursement since 2015. Koya says in the last three years 3,247 businesses in the Suva Nausori corridor have been assisted. He adds this has impacted the lives of 16,235 people. Koya says with today’s disbursement, more than 36,000 micro and small enterprises have been formalized and assisted through the MSBG initiative. He adds this has also impacted the lives of 180,000 Fijians around the country with the Fijian Government’s investment of approximately 36 million dollars since 2015.